Willie Nelson, Harlan Howard, with Hal Smith. Smith, along with Ray Price, owned Pamper Music. Pamper published Patsy Cline hits including “Crazy”, written by Willie Nelson, and “I Fall To Pieces”, written by Harlan and Hank Cochran, and “She’s Got You”, written by Hank Cochran. The “Quonset Hut” is the legendary Studio on Nashville’s Music Row, built by Producer Owen Bradley, where some of the greatest songs in music history were recorded. The “Quonset Hut” was regarded for years as the foundation of Nashville’s Country Music industry. It had the distinction of being the first recording studio in what would later become “Music Row”. In just a few short years , artist of every genre of music walked through it’s doors–creating some of the biggest records in music history such as Patsy Cline’s “Crazy”, Brenda Lee’s “I’m Sorry” and Bobby Vinton’s “Blue Velvet” to name a small few. Owen Bradley is credited as a pioneer in creating the “Nashville Sound”. 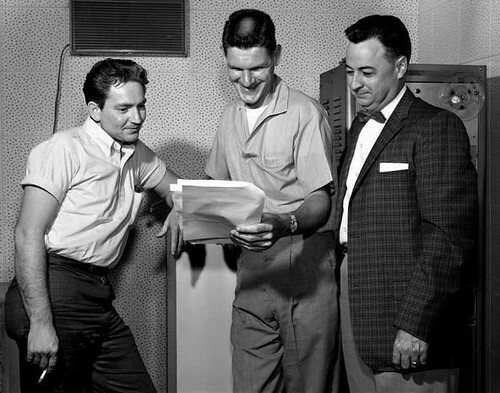 The Bradley’s would sell the studio in February 1962 to Columbia records although they continued to record there until late 1965 when Owen moved his operations to his new state of art facility in Mount Juliet, TN dubbed, “Bradley’s Barn”. In the years that followed Owen Bradley’s exit, the “Quonset Hut” continued to be used as a viable recording space. In 1965 Columbia had demolished the old rooming house and built a new studio known as A–the Hut became studio B. Pop acts such as REO Sppedwagon, Bob Dylan, Edgar Winter, The Beach Boys, Paul Simon & Art Garfunkel, Les Paul & Mary Ford, Bobby Vinton, Connie Francis, Patti Page, Anita Bryant, Clyde McPhatter, Trini Lopez, Dave Loggins, Johnny Ray, Helen Shapiro etc all came to Nashville to record here. In 1982 shortly after John Anderson recorded his crossover hit, “Swingin’”, the facility was closed and gutted for office space. Columbia continued to build around the structure leaving few traces of the original such as the distinguishable curved roof which is still visible today. During the next 25 years, the “Quonset Hut” would be nothing more than a memory until music mogul, Mike Curb ( Curb Records ) stepped in and purchased the property–which was now up for sale–and began plans to restore the historic structure. In 2009, the studio was reopened to serve as a teaching facility for Belmont University students. Owen Bradley was born October 21, 1915 outside of Westmoreland, TN, and raised in Nashville. He began playing piano professionally when he was a teenager, playing in local juke joints, clubs, and roadhouses. When he turned 20, he began working at WSM radio, and within five years he had established himself as an integral part of the station. Bradley began working for Decca Records in 1947 as an assistant to producer Paul Cohen. By working at Cohen’s side, Bradley learned to produce, and assisted in making records by Ernest Tubb and Red Foley, among many others. Eventually, Owen began producing records by himself, whenever his mentor couldn’t travel to Nashville from New York. Owen and his brother Harold opened a film studio in 1951, moving its location to Hillsboro Village within a year. It stayed there for two years, before it was moved again, this time to a house at 804 16th Avenue South with a Quonset hut attached to the main building. The Quonset hut was converted into a studio in 1955 — it was the first studio on the street that would become known as Music Row. Two years later, RCA built a studio a block away from the Bradley hut. Cohen left Decca in 1958, and the label offered Bradley a position as vice president of the label’s Nashville Division. At Decca, he began pioneering the Nashville sound, incorporating orchestration and pop production techniques into country music. Patsy Cline was Bradley’s most successful country-pop production. He had worked with her when she was with Four Star, but when she signed with Decca, Cline’s music shifted toward country-pop and she began a string of Top Ten hits. Following her success, other artists that he produced in that style, most notably Brenda Lee, became successful as well. During this time, Bradley also produced harder-edged hits by Webb Pierce and Kitty Wells. In addition to his record production, Owen released a handful of records by his instrumental quintet, including the minor 1958 hit “Big Guitar.” With his brother Harold, Bradley produced a half-hour television series, Country Style U.S.A., during the late ’50s. Bradley bought a farm outside of Nashville in 1961, converting a barn into a demo studio. Within a few years, the barn was upgraded to a first-class recording studio called Bradley’s Barn, and over the next two decades it became one of the most popular and legendary studios in country music. In 1980, it burned down, yet it was rebuilt with a few years in the exact same spot. Throughout the ’60s and ’70s, Bradley worked with many of Decca’s most famous artists, including Loretta Lynn and Conway Twitty. In 1974, Bradley was inducted into the Country Music Hall of Fame. In the early ’80s, he retired from full-time producing, yet he continued to work on the occasional special project. His last major work was k.d. lang’s 1988 album, Shadowland. Bradley had begun working with Mandy Barnett on a new album when he died January 7, 1998 at the age of 82.